The Japan-Pacific ICT Centre of the University of the South Pacific in Suva provided a large auditorium facility for PacINET 2012, and a great backdrop for learning about internet development in the Pacific. The event was streamed live and recorded, so that remote participants were able to ‘attend’ some interesting presentations. The conference was opened on Thursday 22 November by the PICISOC Board Chair, Maureen Hilyard and the Vice Chancellor of USP, Rajesh Chandra. The Vice Chancellor explained his vision for ICT enhancements at the USP. The keynote speaker was Martin Cocker of Netsafe. Special guest speakers included presenters from: ICANN (International), Netsafe (NZ), ISOC Australia, the Universities of Auckland, Hawaii and Wollongong, and the PISCES Project (US), an ISOC supported project installing solar-powered computer-labs-in-a-box and solar powered long distance WIFI connectivity, in Haiti and Chuuk. The Pacific Disability Forum based in Fiji, presented a very informative session on the need for inclusive website design, and the use of ICT to empower people with disabilities. The panel included Gunela Astbrink, disability advocate, and disabled IT users who explained their difficulties. The Saturday morning session was covered by one of PICISOC’s most successful Special Interest Group – Geospatial Information Systems and Remote Sensoring (GIS-RS). 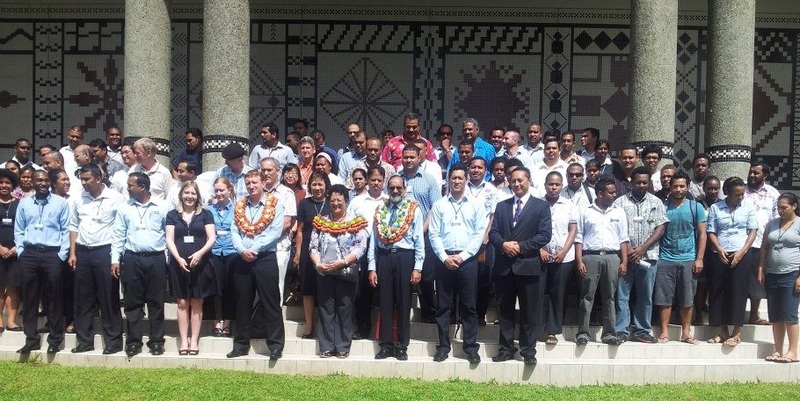 They provided a taster session for their conference which immediately followed PacINET, on the use of GIS and the GeoNetwork, and an introduction to the Pacific Disaster Net. 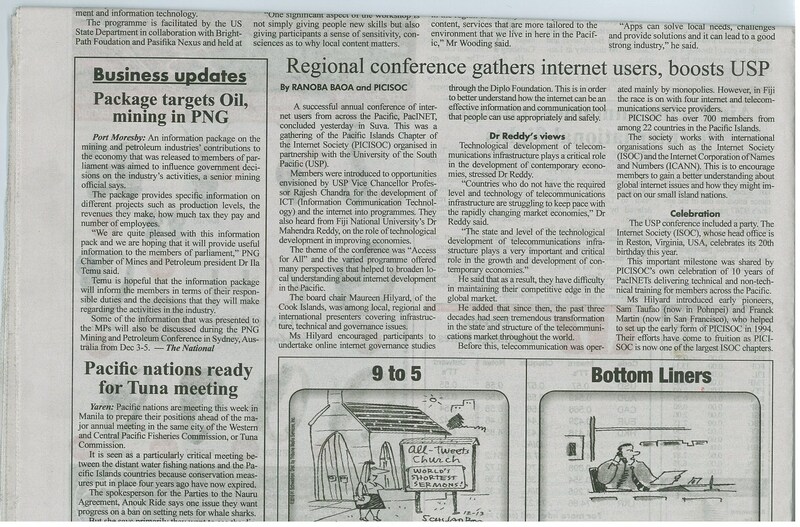 The final day of the conference was our Pacific IGF Day and introduced members to Internet Governance along with some encouragement for members to undertake the online IG course provided by the Diplo Foundation). The ISOC Asia-Pacific Bureau was represented by Duangthip Chomprang of Bangkok. Topics covered to encourage participant interaction included the need for Information management in government included presentations from Vanuatu, Fiji, Cook Islands, and Niue. And, new media and the rise of new technologies as challenges to traditional media were discussed by members of ISOC Australia, Oceanic Communications, Open Media, Femlink and the Pacific Islands Forum Secretariat. The final session provided animated discussion about competition with presentations from Fintel, the Southern Cross Cable and the new Hawaiki cable. A Youth Tech Camp was organised as a side event and provided local youth with an introduction to internet governance and mobile application training. The PICISOC Board would like to thank everyone who attended the conference. We appreciated their interest and their involvement in discussions which encouraged presenters. Special thanks to the on-the-ground Fiji team who organised the conference on our behalf. It would not have been possible without them. We would also like to thank our Board sponsors – ISOC, PIP, USP and SPC – and to the many local businesses who helped us make this wonderful programme happen for us.